The life of every Christian is a life of service, the service of mutual love. The prime examples of this love and service are the love of husband and wife and their love as a couple for their children. I never cease to be amazed at the depth and generosity of the love of couples. I see it, for example, in the care of a husband or wife when their spouse is affected by ill-health. The daily care of husband or wife for a partner in difficult circumstances puts flesh and blood on the promise they made when they got married to love one another ‘for better, for worse, in sickness and in health’. We see too the impact on a couple’s life when a new baby arrives, an event that brings deep joy but that impacts on their sleep, their energy, their freedom and touches them – over the years that follow – and shapes them to the very core of their being. As a result of the decision of the Second Vatican Council, fifty years ago, to restore the Permanent Diaconate and to open it to married men, the Church can now invite into its ministry men with the experience and grace of married life and their experience as parents. Kevin Devine and Gerry Heaney have been blessed in their married lives. With their wives they have been blessed with children and through the impact of their own lives they have handed on their faith to their children. 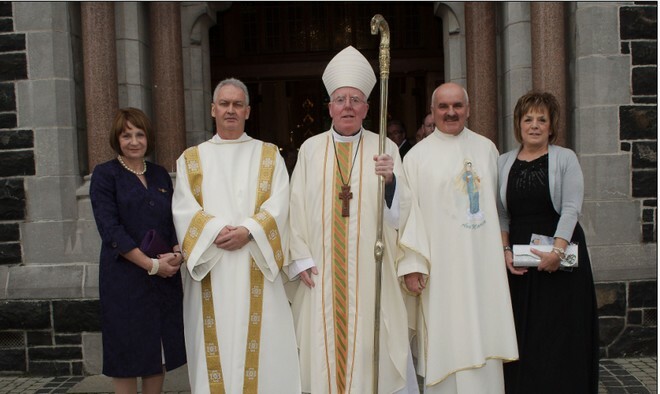 Both Kevin and Gerry have enriched the communities where they have lived and worked by their professional lives; they have also been deeply involved in their parish communities and have enriched those communities with their generous service and goodness. As ordained men, they are called to be ‘on fire’ with the spirit, bringing light and warmth to those they will meet. In a recent interview, Pope Francis said that “the thing the Church needs most today is the ability to heal wounds and to warm the hearts of the faithful”. Saint Paul reminds Timothy that the Spirit he received with the laying on of hands is not a Spirit of timidity but the Spirit of power, and love, and self-control. Paul also asks Timothy not to be ashamed of him, even though he is a prisoner in Rome for the sake of the Gospel. My prayer today is that when you are ordained by the laying on of hands, you will receive the assurance that the Spirit of God will be with you in every aspect of your lives and ministry in the years ahead. My dear brothers and sisters, these men, your relatives and friends, are about to be raised to the order of deacons. Consider carefully the ministry to which they are called: The Holy Spirit will strengthen them to serve the Church as ministers of the Word, of the Altar and of Charity. They will proclaim the Gospel, prepare the sacrifice, and give the Lord’s Body and Blood to the community of believers. It will also be their duty at the bishop’s discretion, to bring God’s Word to believer and unbeliever alike, to preside over public prayer, to baptise, to assist at marriages and bless them; to give viaticum to the dying, and to lead the rites of burial. Once they are consecrated by the laying on of hands that comes to us from the apostles, they will perform works of charity in the name of the archbishop or parish priest. From the way they go about these duties may you recognise them as disciples of Jesus, who came not to be served, but to serve. A common feature of ministry in the early Church and the centuries that ensued, the functions of the Permanent Deacon became absorbed by priestly ministry and the Permanent Diaconate ceased to exist. The Second Vatican Council (1962 – 1965) sought to restore this important ministry of service, the word “deacon” meaning one who serves. In 2005 the Irish Episcopal Conference decided to re-introduce the Permanent Diaconate to Ireland and the first Permanent Deacons were ordained in Dublin in 2011. A Permanent Deacon receives his mission from his bishop, and is assigned to work as a member of a team under the leadership of the Parish Priest. The Permanent Deacon is called to minister in close-collaboration with priests and with laity who are entrusted with various ministries. Whilst deacons play a key role in the development and coordination of lay ministry, they are not intended to replace lay ministries. – Mr Kevin Devine, Parish of St Peter, Lurgan, married to Moya, two children, Catherine and Kevin. Kevin is a teacher. – Mr Gerry Heaney, Parish of Moyraverty, married to Phyllis, two children, Geraldine and David. Gerry is a retired teacher. Mr Liam McArdle is the official photographer for the ordination Mass. Liam can be contacted for photographs on 0044 7900 107362.